A bowl of couscous with vegetables sits on a wooden table. A common food staple in Morocco, couscous is made from light semolina wheat and can be eaten as a healthy alternative to rice and pastas. 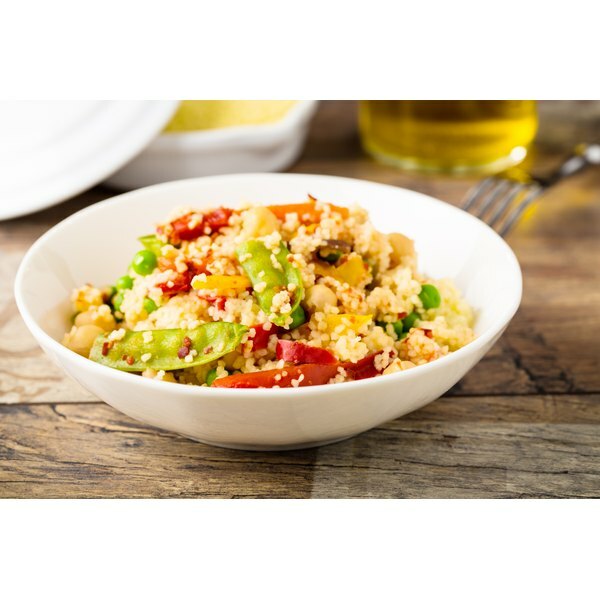 Couscous is also a good source of nutrients including vitamin A and potassium and is naturally low in calories, with only 110 calories per 100 g. The small, fine grains of couscous are easy and fast to make. Heat 1 tbsp. oil in a pan and add any spices you would like to flavor the couscous with. These might include garlic, ginger, onions, cumin, chili or other herbs and spices. Fry the spices until they are lightly browned. Add 1 1/4 cup of water or diluted chicken or vegetable stock to the pot. Using stock gives the couscous a richer taste. Stir in 1/2/ tsp. of salt. Bring the water to a boil and reduce the heat to low. Add 1 cup of dried couscous grains to the pot so that the grains are completely covered by the water. Cover the pot for about 5 minutes to allow the couscous to cook. Uncover and gently stir to separate the grains. The fluid should be absorbed by the couscous. If there is still fluid in the pot, allow the couscous to continue cooking with out covering. If the couscous is not yet cooked and there is no fluid in the pot add 1 to 2 tbsp. of water as needed, cover and let cook for another 3 to 5 minutes. Add 1 tbsp. of butter if desired to the cooked couscous and fluff with a fork. Serve the couscous hot with a vegetable tagine, lentils or lamb or fish stew. Flavored couscous can also be eaten with a salad by adding lemon juice, olive oil and coriander or parsley. You can also add chickpeas, cannellini or kidney beans to the couscous to add extra protein, fiber and flavor. You can also add toasted pine nuts or almonds. 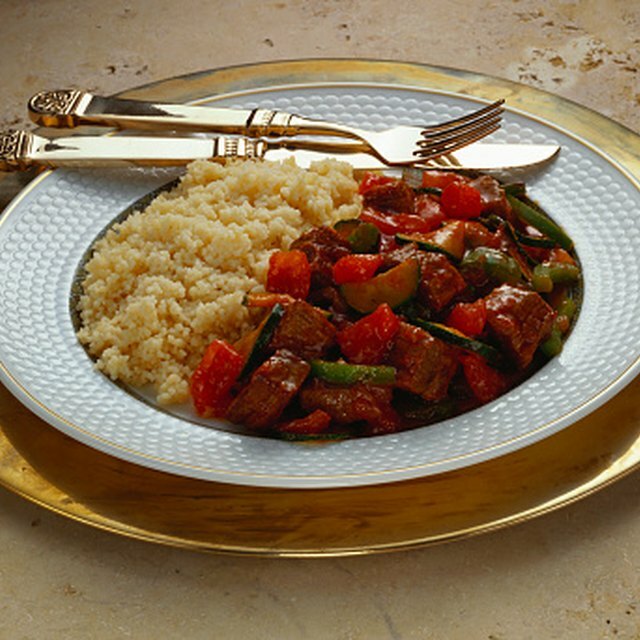 Use whole wheat couscous for more nutrition and fiber. Store couscous covered in the fridge to use with leftovers. The small, soft grains of couscous cooks very quickly; don't leave the pot unattended to avoiding burning or overcooking it. Use a pot holder when handling hot cooking pots and lids. Keep exposed skin away from the top of the boiling pot when you are opening the lid to avoid steam burns.